Why is it a Great Gift ? : Great way to say 'I Love You' from a distance by sending a huggable, lovable message bear. Get even closer to your loved one by sending this on Valentine's or just about any day of the year - because the Love season is all year round. 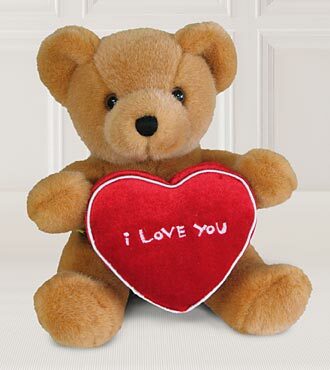 Send a message of love this Valentine's Day with this charming bear, stuffed with hugs and good wishes. This child safe and adult friendly bear is all dressed up in his best vest, bearing red velvet roses and ready to love. Includes birth certificate for the bear. Delivery is made by a local florist or by courier service such as FedEx / UPS. Unfortunately we cannot guarantee delivery at a specific time of day. During the holidays deliveries may be made as late as 9p.m. Recipient unavailable for delivery: If the recipient is not available at the time of delivery, the delivery person may leave the gift in a safe place for the recipient to retrieve when they return or attempt delivery the next day. Please provide the recipient's phone number in the Gift Message or Address fields during checkout. This may be used if the local florist is unable to locate their address or for delivery instructions. Refunds / Cancellations: Orders once placed and paid for cannot be canceled. Refunds are not available for this item.